In the 5th century, the Iberian Peninsula (the Roman Hispania) was conquered by the Germanic Suebi and Visigoths. As they adopted the Roman civilization and language, however, these people contributed with some 500 Germanic words to the lexicon. Many of these words are related to warfare – such as espora 'spur', estaca 'stake', and guerra 'war', from Gothic *spaúra, *stakka, and *wirro respectively; the natural world i.e. suino 'swine' from *sweina, gavião 'hawk' from *gabilans, vaga 'wave' from *vigan' human emotions such as orgulho or orgulhoso ('pride', 'proud') from Old Germanic *urguol or verbs like gravar 'to craft, record, graft' from *graba or esmagar 'to squeeze, quash, grind' from Suebian *magōn or esfarrapar 'to shred' from *harpō. The Germanic languages influence also exists in toponymic surnames and patronymic surnames borne by Visigoth sovereigns and their descendants, and it dwells on placenames such as Ermesinde, Esposende and Resende where sinde and sende are derived from the Germanic sinths (military expion) and in the case of Resende, the prefix re comes from Germanic reths 'council'. Other examples of Portuguese names, surnames and town names of Germanic toponymic origin include Henrique, Henriques, Vermoim, Mandim, Calquim, Baguim, Gemunde, Guetim, Sermonde and many more, are quite common mainly in the old Suebi and later Visigothic dominated regions, covering today's Northern half of Portugal and Galicia. ^ "Top 11 Most Spoken Languages in Africa". 2017-10-18. 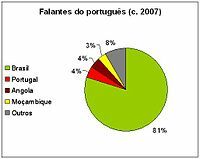 ^ Angola: Language Situation (2005). Keith Brown, ed. Encyclopedia of Language and Linguistics (2 ed.). Elsevier. ISBN 0-08-044299-4. ^ Carvalho, Ana Maria (2010). "Portuguese in the USA". In Potowski, Kim. Language Diversity in the USA. Cambridge University Press. p. 346. ISBN 978-0-521-74533-8. ^ "The World Factbook – Field Listing – Population – CIA". Central Intelligence Agency. Retrieved 2019-03-30. ^ "The World Factbook – Field Listing – Population – CIA". Central Intelligence Agency. Retrieved 2015-03-07. ^ por Caipira Zé Do Mér dia 17 de maio de 2011, 6 Comentários (2011-05-17). "O MEC, o "português errado" e a linguistica... | ImprenÇa". Imprenca.com. Archived from the original on 19 April 2012. Retrieved 23 July 2012. 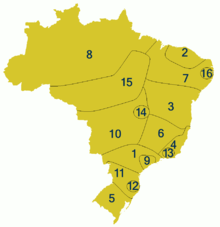 ^ "Fala NORTE". Fala UNASP – Centro Universitário Adventista de São Paulo. 2010-11-24. Archived from the original on 22 December 2012. Retrieved 25 September 2012. ^ a b Lipski, John M (2006). Face, Timothy L; Klee, Carol A, eds. "Too close for comfort? the genesis of 'portuñol/portunhol'" (PDF). Selected Proceedings of the 8th Hispanic Linguistics Symposium: 1–22. Retrieved 21 June 2015. ^ a b "A Fala Galego-Portuguesa da Baixa-Limia e Castro Laboreiro" (PDF). Retrieved 2018-10-05. 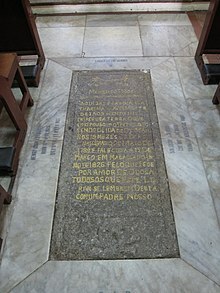 ^ "Jerónimo Cantador de Argote e a Dialectologia Portuguesa (continuação)". Lusografias. 2008-08-27. Retrieved 30 May 2015.